The flexible Monocrystalline Solar Module Apollo Flex 107W is suitable for use in most environments, even with saltwater. The modules are maintenance free, and weather-resistant with a long durability. One of the most important technical features of the Solar Module Apollo Flex 107W modules are the high efficient back-contact solar cells which are the most efficient solar cells available on the market at the moment. They combine a high charging voltage at high temperatures with an efficient charging capability. Euro-Line Solar GmbH from Germany is a supplier of off-grid solar and wind power solutions for the outdoor, motorhome, and marine markets as well as custom solutions for commercial customers. ELS products can be integrated into existing products and applications. The company is headquartered in Berlin, Germany. Join our ZERO Home Bills Community. 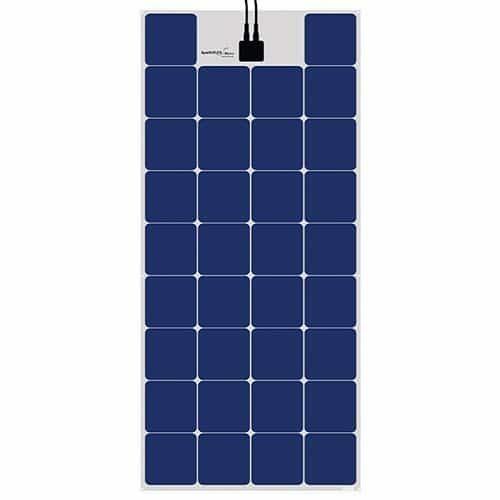 The Best Semi Flexible Solar Panels from the BEST Solar Brands at the BEST Retail Prices available in your market on ZEROhomebills.com by Solaranna. Check out all the products from Euro-Line Solar GmbH. Euro-Line Solar GmbH from Germany is a supplier of off-grid solar and wind power solutions for the outdoor, motorhome, and marine markets as well as custom solutions for commercial customers. Euro-Line Solar products can be integrated into existing products and applications. Euro-Line Solar is headquartered in Berlin, Germany. Join our ZERO Home Bills Community. BEST Products from the BEST Brands at the BEST Retail Prices available in your market on ZEROhomebills.com by Solaranna.